There's no reason to settle for a middling dividend yield. Many investors buy technology stocks for growth. That strategy is certainly working this year -- the tech-heavy Nasdaq 100 index is up a whopping 32% year to date. Some large tech companies, including Alphabet, Facebook, and Amazon, don't pay dividends at all, instead plowing cash back into their businesses or piling it up on their balance sheets. But that doesn't mean dividend investors are left out in the cold. There are plenty of tech stocks that are also great dividend stocks. The best of the bunch is International Business Machines, a century-old tech company in the middle of a reinvention and plagued by pessimism. That pessimism has knocked down the stock price and boosted the dividend yield, making IBM the clear-cut winner for dividend investors. IBM investors haven't had a lot of fun over the past five years or so. The stock is down nearly 30% from its multiyear high reached 2013, a side effect of a half-decade of slumping revenue. IBM has been shifting toward growth areas like cloud computing, artificial intelligence, and security, but growth in those areas has yet to offset declines elsewhere. IBM's dividend has kept growing throughout this period. That growth, combined with the slumping stock price, has pushed IBM's dividend yield up to nearly 4%. Compared to other large tech companies, IBM's dividend is in a league of its own. 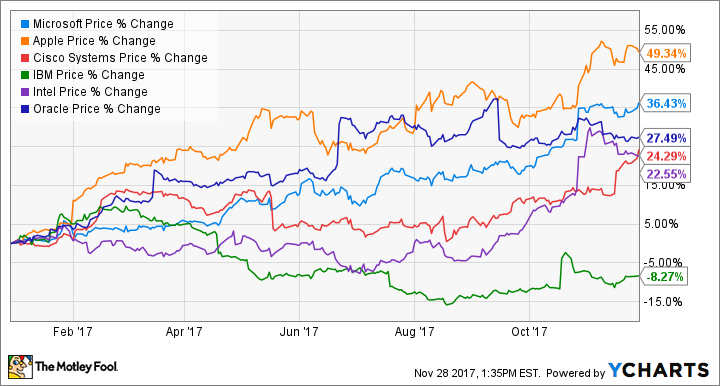 Of these six companies, IBM is the only stock that has slumped year to date. The rest have gained at least 20%, with Apple gaining nearly 50%. This divergence has helped push IBM's dividend yield far above those of its peers. The dividend yield is only half the story. The other half is the payout ratio, which is how much of a company's earnings goes toward the dividend. If the payout ratio is too high, future dividend growth could be imperiled. A low payout ratio signals that there's plenty of room for dividend growth, even if earnings growth is sluggish. IBM has the highest payout ratio, as a percentage of trailing-12-month free cash flow, among these six companies. But at just a hair over 50%, it's not high enough for dividend investors to be concerned. IBM's free cash flow has slumped since it began its transformation, but the company expects free cash flow to be roughly flat this year. IBM's dividend probably won't grow quite as fast as some of these other tech companies, but the much higher yield more than makes up it. IBM's dividend track record is also worth mentioning. The company has paid consecutive quarterly dividends since 1916, and it's increased its dividend for 22 years in a row. Microsoft only began paying a dividend in 2004, and Apple restarted its dividend program in 2012. Cisco started paying dividends in 2011, and Oracle started in 2009. Intel has been paying dividends since 1992, a few years before IBM began its dividend growth streak. IBM's high dividend yield may not seem as appealing given the company's recent performance. Revenue has been slumping for five years, despite strong growth in cloud computing and other growth areas. The bottom line is down as well, although the company expects a small increase on an adjusted per-share basis this year. And, of course, the stock is underperforming by a wide margin. But IBM is finally on the cusp of returning to growth. The company expects its newest mainframe, which launched earlier this year, to drive a strong fourth quarter, strong enough to produce year-over-year revenue growth. At the same time, IBM's growth businesses now account for about 45% of trailing-12-month revenue while growing at a double-digit rate. The cloud business is now 20% of revenue, and growing at a 20% rate. Even with the free cash flow depressed, the dividend is sustainable and capable of growing. If IBM can grow the free cash flow in the coming years, the dividend will have even more room to expand. With IBM stock trading for just 11 times its guidance for adjusted earnings this year, investors can get a near-4% dividend yield, along with a long history of dividend growth, all for a bargain price.